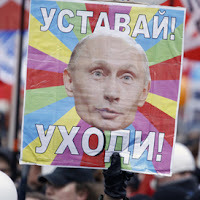 Is Also Russia Finally Awakening? 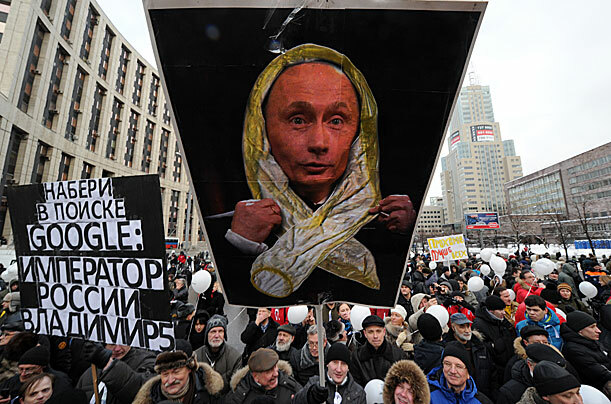 For Newsmill.se: As tens of thousands gather in Moscow and other Russian cities, it is in protest against a corrupt regime, which no longer can provide its people with a belief in the future that might legitimize its further possession of power. The feeling of "we cannot live like this anymore" that became the hallmark of the last days of the soviet empire has reawakened, but the question is only how decisive this feeling will be for the further development of the country. Russia is currently undergoing one of the most interesting and crucial phases since the Russian revolution. In contrast to the chaotic collapse of the Soviet Union, these are developments that are met with open eyes. Fundamentally, it is a question of whether the political system that has been created may assume the great structural challenges, which the country will meet with over the next decade. In short, all the problems and deficiencies that have been ignored since 1991 will peak around 2020: Demography, infrastructure, economy, environment, health and medical care, education, etc. The list goes on in what seems like eternity, but it essentially means that the people will meet with an increasingly tougher everyday life at the same time as people in power either do not want to or are unable to do anything about it. The comparison with the dramatic fall of the Soviet Union however risks leading thoughts astray, as the challenges Russia currently is facing are of another character and dignity than was the case 20 years ago. The country instead is sick with a slow but fatal disease if not proper medication is administered. 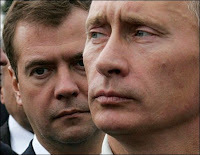 Here, the question is whether Putin and Medvedev are the right doctors. That we now see people take to the streets and squares on a scale not witnessed since the soviet demise in 1991 is on the surface a consequence of the farcical fraud that took place at the 4 December parliamentary elections. To an even higher degree, it bears witness of a growing popular realization of a profound systemic crisis and that the current regime is uncapable of assuming rising challenges. Power is not even capable of arranging election fraud without it becoming embarrassingly obvious how badly organizsed even the fraud is. For Russians in general it thereby stands beyond doubt that elections are primarily intended for the division of power within the reigning United Russia party and not even represents an approximate popular will. That is an arrogance of power that fewer and fewer Russians are willing to accept. That a Google search under the Russian term of "party of crooks and thieves" ends up with United Russia as first result is as good an evidence as any of how corrupt the regime is considered. People are simply not prepared to go on along a road chosen that seems to go over the cliffs. The question is how strong and wide the public wrath is and if it is sufficient for continued and increased outdoor protests in sub-zero degrees when the Russian New Year approaches with party and leisure. 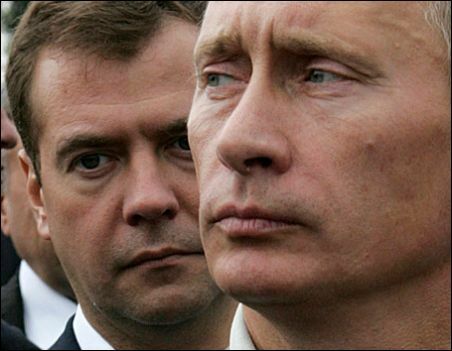 Disconent with the system still remains and handling it may become a hard task for both Putin and Medvedev for the upcoming 4 March presidential elections. A lot may still happen before then. What kind of a system is it then that has been constructed during the Putin era and now is questioned by an increasing number of people? Simplified, it is a classic trade-off between power and people. Political power is handed over to an elite in exchange for economic prosperity. From an ideological perspective, Russia's political system is very alarming in combination with a failure of power to deliver on its economic promises. That civil rights and freedoms have been heavily limited over the last decade has probably been observed by most. These limitations are however not only systematic but depart from an interpretation of the constitution with very reactionary roots. The role ascribed to presidential power under Putin departed from the ideology of the reigning party United Russia, which then was called "sovereign democracy". The fundament is a system where the president - or sovereign - always has the final say. In its pure form, the president has the constant right to proclaim a state of emergency without democratic accountability.What constitutes a rule of exception, only the president is privy to determine. In essence, it is from this constitutional interpretation that the country's systematic limitations of civil rights and freedom should be perceived. In current Russia the Damocletian sword is constantly hanging over the heads of each and everyone who expresses a divergent view and opposition is considered extremism and an attempt to usurp state power. Despite president Medvedev's skepticism towards this constitutional interpretation and a high measure of pragmatism in its implementation, it remains a political system practically applied. The practical reason is that supreme political power in Russia has been transformed into a role of arbiter between conflicting political and economic interests, which lack democratic legitimacy and mandate. 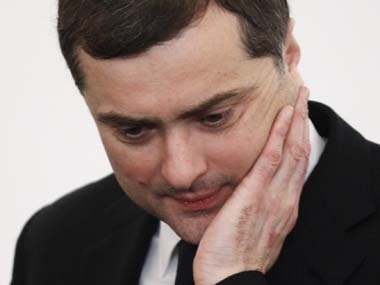 It is in light of this that the reigning United Russia party should be considered a representation of disparate interests, where primarily Putin but also Medvedev have had to act as arbiters to preserve domestic peace among cynical actors only looking out for their own egotistical interests. As parliamentary elections were carried through, the main purpose was to divide power and positions between different interests within United Russia and not to allow for any expression of real public will. Why then protest now, in connection to elections to an apparently powerless parliament, when elections for the mighty presidential office awaits in just a few months time? As the Russian electoral system has been designed, it constitutes a two-stage rocket, where parliamentary elections in December determines the division of power within United Russia and presidential elections in March decides who will act as arbiter during the coming six years. That an increasing number of Russians now rise against this system is thus not that strange, as the parliament by way of United Russia symbolizes the corrupt exercise of power felt in everyday life. Protests emanate more from the effects of the system than from its contents. That the economic component of the trade-off between elite and people has failed is obvious. United Russia's urging the Russians to "enrich yourselves" has not been accompanied by such economic liberalizations that would allow for a wider popular enrichment. Against the background of growing corruption and bribery, today's Russian youth do not consider enterprise and entrepreneurship as a method to reach a reasonable living standard. Instead, the youth is encouraged to seek their livelihood by serving the state within the public sphere. That the future of the young generation would lie within the public sector however rests on the cynical perspective that the more people are corrupted the less will be the interest to upset the fundaments of the system. What stands out is a reality where on the one hand every public office may be purchased at a determined price and on the other hand that the citizens' price list to access public services is decided by the cost of appropriating a public office. As bureaucracy grows, corruption feeds itself and becomes sui generis in a way that lies beyond the bounds of any political exercise of power. In this context, the December parliamentary elections have become a symbol of the corruption and lawlessness, which means that many Russians have lost their fate in the future. Considering the fragmented opposition and an almost total lack of political alternative, the political failure of Putin and Medvedev becomes evident. Basically, this failure consists of increasing differences between political vision and reality. Despite the image in the West of great limitations on societal discourse, the discussion of the great challenges Russia is confronting has been both extensive and nuanced, and pointed to both acute and necessary measures from area to area. 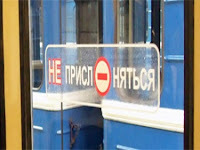 Most Russians thus know what awaits during the coming years if not drastic and extensive measures are imposed. Putin, Medvedev, and United Russia, have also presented plan after plan, which though have fallen apart when confronted by realities. Plans may be great, but without the capability to implement them, they eventually just end up the object of ridicule. The system's principle for a divsion of power has simply left Russia without a competent and powerful leadership. Here, primarily Putin has eroded the ground he himself is standing on by allowing for a leader cult of himself. In the official image, Putin is portrayed as the potent, enlightened and determined leader, while Medvedev represents the reform, development, and innovation that will lead Russia towards the future. The image of Putin as the strong-man has though gone so far that he as a person and politician increasingly stands out as almost ridiculous in confrontation with reality. The people of Russia is today met with a political leadership characterized by impotence and incapability - hopelessly dug down in attempts to balance the internal struggles of the elite over political and economic power. The power's message to the people seems to be: "Stay put in the sinking vessel!" That the people now asks "Can we live like this anymore?" - despite the absence of political alternatives - bears witness to the deep crisis of the system. The question is still if the Russians have concluded that "We cannot live like this anymore." Is it really the case that Russia is awakening out of its torpor by the realization that an authoritarian system cannot solve the challenges of the future? Free the imprisoned Egyptian bloggers! This call is being circulated by Swedish bloggers, and in Swedish Social Media, today. Please join in, repost or sign the petition! In times when freedom of the press is suppressed and media controlled by government or other interests, the responsibility of pointing out wrong-doings, falls to the citizens. The civil journalism found on the internet form an integral engine for developing democracy in many countries. With blogs and other social media as their tools, they expose injustice and misconduct in the society, even when the media landscape is being completely controlled. As the Arab Spring's historical events have shown, bloggers are not only citizen-journalists. With them they carry the hope of democracy, freedom and dignity to all. Freedom of speech on the internet, has become one of the most important dividing lines between dictatorship and democracy. Here you lift injustice and wrong-doings in the every-day life, and with the might of the pen you work towards change. In many places the situation, for those that are engaged in democratic change, has become increasingly difficult. Several countries imprison or persecute people that criticize their governments openly in social media. One example of this is the faith of the Egyptian bloggers Alaa Abd El Fattah and Maikel Nabil. Alaa Abd El Fattah is one of the main activists in the large and lively Egyptian blogosphere. In 2006 he was arrested, by the Mubarak regime, to set an example to other bloggers. Bloggers that critically discussed the things that happened in Egypt were regarded as a threat. Unfortunately nothing has changed and today the process of democratization is endangered by this. 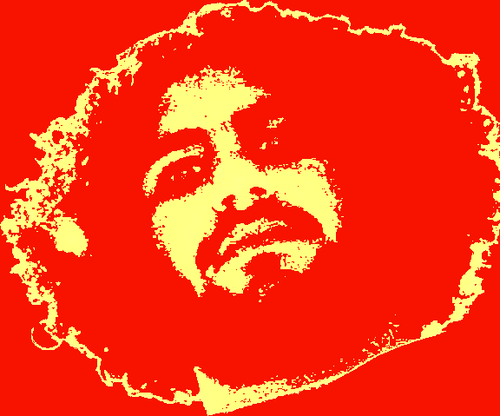 About a month ago, Alaa was imprisoned again. This time it was the ruling Military Council of Egypt. His time in captivity is prolonged by two weeks at a time, which causes his family great concern, and especially his pregnant wife. The process against him shows that the aim is to silence an important node in the movement for democracy in Egypt, before the election. Earlier this year this movement toppled the dictator Mubarak, and it is once again taking the protests out to the streets. Yet another civil rights activist, Maikel Nabil, has been in prison since the end of March this year, accused of distortion of the slogan of the Egyptian Military Council, 'the army and the people are one hand', at his blog. He discussed and criticized the development after the fall of Mubarak, under the heading "The army and the people are never one hand". This was interpreted by the regime as an attack on the system, and Maikel is now serving a three-year sentence for high treason. Alaa and Maikel are far from alone. In addition, they are used as warning examples to intimidate others not to challenge and criticize injustice, or speak in situations where others remains silent. In a democracy-under-construction, this is a sign of a dangerous development that the surrounding world ought to react on. We, the undersigned, have all, just as Alaa and Maikel, chosen to participate in the public conversation through blogs and other social media. We hope that more people wants to raise the issue of the importance of free speech, and show the surrounding world that we take notice and that we care. Freedom of speech and thought must be respected, and all bloggers that are being imprisoned because of their opinions must be freed immediately! Our message is clear: Free the champions of free speech! For Global Voices Online: "East is East and West is West, and never the twain shall meet." This chronically misused Kipling phrase seems to catch realities for an increasing number of Belarusians, as recent protests and crises have become a rude awakening from the torpor of the last Soviet "sleeping beauty." Waking to a wild and hostile world, many people now start asking: "Who cares about Belarus?" Coverage found in the Western media of the recent developments in Belarus largely follows the general pattern of repression, with a few opposition activists highlighted, but still with little added to the familiar story. It is true that the economic crisis that has recently hit the country and Russia's gradual takeover of Belarus' economy have added spice to the stew, whilst the ultimate news would be the ousting of President Lukashenko. Until that day, though, Belarus seems deemed to remain in limbo between East and West. Or would Lukashenko or no Lukashenko really make a difference? An increasing number of voices in Belarus say that the limbo will linger on, and Belarus is bound to remain in a grey zone between East and West. Беларусь пошла с молотка и это очевидный конец. Руководство Беларуси заключило сделку и тихонько распродаёт страну, в расчёте на политическое убежище, все наши ура-патриоты спокойно на это смотрят. Основные предприятия страны переходят в собственность к России, это российские капиталовложения в нашу собственность. Как можно это допустить и как может ЕС так спокойно упускать свои перспективы на будущее в Беларуси?! Это же полный провал европейской политики, тем более в ЕС нарастает огромный финансовый кризис, европейский бизнес девать просто некуда. Это немощный инфантилизм и позор, нельзя допускать завершения сделки с Россией, это огромная ошибка, нужно срочно принимать меры! Belarus went under [the auctioneer's] hammer and it was a foregone conclusion. The leaders of Belarus made a deal and are quietly selling off the country, counting on political asylum, and all our hooray-patriots calmly look at it. The main enterprises of the country are becoming Russian property. It is a Russian investment in our property. 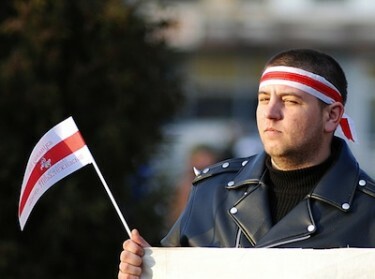 How can this be allowed, and how can the EU so calmly give up on its views on Belarus?! It is simply a total collapse of European policy, especially as an enourmous financial crisis is brewing in the EU, and European business simply has nowhere to turn. It is powerless infantilism and a shame. Оne cannot allow dealing with Russia. It's a big mistake, and urgent action is needed! Нет правды в Беларуси. Десятки лет мы получаем лживую информацию, слышим безответственные обещания, видим потемкинские деревни. Наелись. Все цивилизованные страны единодушны в оценке и называют такое поведение властей издевательством над народом. Но как оценить издевательство над многострадальными гражданами посольств этих цивилизованных стран, когда после заявлений о смягчении визовых режимов для белорусов, отказывают в визе даже тем белорусам, которые по всем критериям очень даже выездные. [---] Мой сын закончил третий курс университета. Хотел съездить во Францию по частному приглашению. Получил отказ. Поскольку ничего плохого за ним никогда не водилось, единственной причиной отказа считаю административный арест 19 декабря на 15 суток. Он проходит по спискам и, скорее всего, поэтому посольство Франции ответило: «У нас нет уверенности, что вы покинете страну по истечению срока визы». Интересно получается. Два списка фигурируют для запрета въезда в Евросоюз: официальный - список чиновников и неофициальный список задержанных. [---] И стало, знаете, очень обидно. И очень одиноко. И за демократию бьют по голове, и демократия бьет по голове. И никому мы не нужны. Ладно бы не нужны – и на порог не пускают. А главное, никакими демократическими процедурами это решение не оспорить. Где справедливость, где права человека, какие гаагские суды рассматривают отказы в выдаче визы? Какие правозащитные организации защищают таких людей? А главное, отличается ли белорусская судья, превентивно выносящая приговор за несовершенное правонарушение, от французского чиновника, отказывающего в визе за несостоявшийся невозврат? There is no truth in Belarus. For decades, we have been getting a pack of lies, listening to irresponsible promises, seeing the Potemkin villages. We are fed up with it. All civilized countries unite in their judgment and name such conduct of power a mockery with the people. But how is such mockery with the long-suffering citizens valued by embassies of these civilized countries, when - after declarations of a softened visa regime for Belarusians - visas are denied even to those Belarusans who really by all criteria are liable for them. [---] My son finished his third year at university, and wanted to go to France on a private invitation. He got a rejection [to his visa application]. As he has never been up to anything bad, the only reason for rejection, I think, is the administrative [post-election protest-related] arrest on December 19 for 15 days. He is on the lists, and therefore, supposedly, the French Embassy replied: «We don't know if you leave the country after your visa expires». It all becomes interesting. There appears to be two lists for denial of entry to the European Union: An official - the bureaucrats' list - and an unofficial list of those who had been arrested. [---] And then, you know, it becomes really hurtful. And very lonely. Getting hit on the head for democracy, and then getting hit on the head by democracy. Nobody needs us. It's okay if we are not needed, and not let over the threshold. But the main thing is that there are no democratic procedures by which to appeal this decision. Where is justice, where are human rights, which Hague courts review the denials of visas? What civil rights organizations defend these people? And above all, does a Belarusian judge, who preventively passes verdict for a crime not committed, differ from a French bureaucrat, who denies a visa for a non-return that has not taken place? Как мы вскормили диктатора. Это вопрос, который я себе задаю постоянно. Мучительно вспоминаю, как и когда я сама впустила в себя эту диктатуру. Свято верю, что в каждой судьбе должен быть такой момент, когда ты соглашаешься со злом только потому, что твой двоюродный брат работает в КГБ и он – клевый парень, а тебе не хочется его обижать. Или хвастаешься другом, который парится в парилке с личным сантехником Его Величества. Шугаешься коллег или сокурсников, которые связаны с оппозицией. Думаю, что здесь, в бай-политикс собрались те, которые, возможно, ничего такого не делали. Но все же. [---] И теперь вопрос каждому: что ты лично сделал для того, чтобы в Беларуси воцарился диктатор? How did we nourish a dictator? It's a question I ask myself all the time. It is painful to remember how and when I, myself, let this dictatorship in. I sincerely believe that in every destiny there has to be such a moment when you consent to evil only because your cousin works for the KGB, and he is a cool guy and you don't want to hurt his feelings. Or you boast about a friend who has steamed in the same sauna as His Highness. You vilify those colleagues or classmates who are connected with the opposition. I believe that here, in the .by-politics, those have gathered who perhaps did nothing like this. But still. And now a question to each and everyone: What have you personally done so that a dictator could reign in Belarus? So, as the shrill voices of Lukashenko loyalists and opposition activists reach crescendo, perhaps there are weaker voices wondering why they cannot simply be allowed to be here, "tuteishi", and lead a normal life between Russia and Europe. Kipling's famous poem on East and West has a less-known ending: "But there is neither East nor West, Border, nor Breed, nor Birth, When two strong men stand face to face, though they come from the ends of the earth!" So, even if Russia and Europe, as two strong men, would learn to respect each other, where would that leave Belarus but in a grey zone? Perhaps, for many Belarusians, East is East and West is West, and there is no place for the rest, living in between. 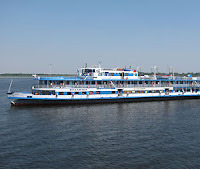 For Global Voice Online: As casualty numbers rise from Sundays' ferry catastrophe on the river Volga, Russians have come to the bitter realization of yet another tragedy, with a death-toll of well over a hundred people. As usual, news of deplorable conditions are brought to public attention, causing popular anger and indignation, but this time these feelings almost seem to outdo those of sympathy with the victims and their relatives, as the Russian blogosphere reacts to the tragedy. 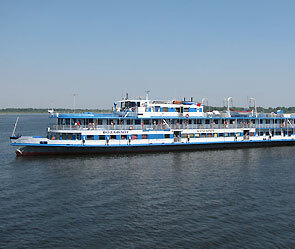 On Sunday afternoon, July 10, 2011, the "Bulgariya" cruise-ship capsized on the Kuibyshev dam of the Volga river. According to official figures [ru], 129 passengers are still missing and have supposedly perished in the waves. How people react to disaster and catastrophe is often quite telling of the times and circumstances they live in, and what they expect from the future. 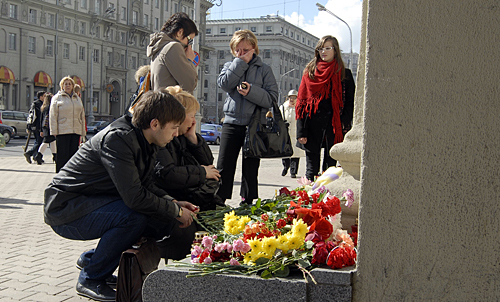 In disaster-ridden Russia, such tragic events are often an opportunity to display national unity in commemoration of the victims, which people usually show great respect and reverence to. Thus, President Dmitry Medvedev declared [ru] 12 July, 2011, a national day of mourning. Still, reading Russia's blogosphere, the sense of national foreboding seems to overshadow that of mourning, as - for many bloggers - the sunk vessel comes to symbolize the future fate of Russia. At first though, the deplorable state of the ship was a subject of intense discussion, both in mainstream media and on blogs. Whereas information is diverse and varies, the overall impression is that of a floating coffin. The relatively moderate - and changing - data on the Bulgariya on Russian Wikipedia [ru] is quite telling: Built in 1955, no waterproof bulkheads, no major overhauls, name-change last year, low lateral stability, leaving port with a 5 percent starboard list, left engine out of order, 208 people on board instead of the assigned 140 maximum; all in all led it to sink in merely three minutes. One does not have to be a sailor to see that "Bulgariya" was not seaworthy, and one can only imagine the number of hurdles the people running it must have jumped to get it past naval safety inspection and other controls. Suffice it to say, heads are gonna roll as a result of this. The responsible parties are gonna get learned, kiddies… they’re going to absorb the full meaning and implications of каторга (katorga: forced labour) in Correctional Colony 1313 in the Sakha Republic… or, they’ll have the pleasure of the multifarious joys of Correctional Colony 3131 on Cape Anadyr. They fought the law and the law won! It ain’t nice to fool around with Papa VVP… things tend to happen (like bustin’ rocks under the Arctic sun). It’s not like the Republican Wonderland of Texas… where Kenneth Lay of Enron fame (pal of GWB and loudmouthed Born-again “Christian”) didn’t serve a day in prison. You can have an attitude like Russia’s, where miscreant businessmen go to jail… or, you can have an attitude like Texas, where buccaneer businessmen are coddled. In 2012, you can choose… choose well… for you’ll not get a “second chance”. Contrary to this, a great number of bloggers show distrust towards government authority, pointing to its recorded pattern of bad information management even when confronted by obvious crises and disasters. Thus, initial official information of the Bulgariya catastrophe spoke of an accident but no casualties. Во время этой трагедии, поразила не только неспособность государства, дать какую-то вразумительную информацию обществу, но и то, что мимо тонущего судна спокойно проходили другие теплоходы, а люди стоявшие на палубе снимали трагедию на видеокамеры и телефоны. Эта дикость, от которой мурашки бегут по коже, свидетельствует только об одном: люди настолько зачерствели, что перестали быть людьми. During this tragedy, I was struck not only by the state's incapacity of providing society with some sort of intelligible information, but also that other ships silently passed by the sinking ship, and people stood on deck filming the tragedy with video cameras and [mobile] phones. This is a savagery that makes one feel like ants are running across one's skin, and only testifies to one thing: People have become so petrified, that they have ceased to be human. Налицо все признаки того, что питерская ОПГ, теряет контроль в управлении страной [---]. Каждый день государственная власть поражает нас новшествами по усилению безопасности граждан и обустройству России. После всего этого можно будет списать население. И тогда наступит настоящий День Траура. Жаль только, что соблюдать его будет некому, ибо придет Время Троглодитов. There is every evidence of the St. Petersburg gang losing control of managment over the country [---]. Each day state power introduces new measures to strengthen the security of its citizens and to upgrade Russia. A bomb exploded at Domodedovo [airport] - stricter passenger control, and closing Domodedovo. After all this, one might as well write off the population. And then we will have a real Day of Mourning. It's a pity only, that no-one will observe this, or [if they will] then comes the time of the Troglodytes. Relating to this, I came to think of a small poem from 1989, which then passed from hand to hand and almost got us thrown out of school. The poem was learnt by heart (so that they could not catch us with sedition on our palms), and therefore I remember it. It described the most notable horrors of katastroika [combined catastrophy and perestroika], (especially the loss of the ship "Admiral Nakhimov" in 1986) and is terrifyingly similar to today's realities. - What happened with your boat? And Mededev has still not found out what to say about this. The systemic crisis is increasingly evident, and the situation is not getting any better. And under current circumstances, it is not likely to. For Global Voices: Ratko Mladic, former Bosnian Serb military leader was arrested today by police in Serbia, the country's president, Boris Tadic, confirmed on national television. General Mladic has been on the run since 1995 facing charges of genocide for his role as Bosnian Serb military commander during the 1992-95 civil war in Bosnia-Herzegovina. Mladic will now most likely be extradicted to face charges at the UN war crimes tribunal in the Hague, Netherlands. Initial blogger reactions are mostly jubilant. It is with a sense of relief and disbelief that many Bosnians and Serbs alike today learn about the arrest of Bosnian Serb general Ratko Mladic, charged with genocide and war crimes during the 1992-95 civil war in Bosnia-Herzegovina. The arrest of Ratko Mladic may come as a surprise to many, but international pressure has been building in recent years that Serbian authorities finally bring the general to justice. I am in Kozarac now, a place razed to the ground in May 1992. I went to Trnopolje today for a commemoration, and I could see in people’s faces the pain. But then I came back to Kozarac and got the news. Tears of joy in everyone’s eyes, and a feeling of disbelief, that a moment in which nobody believed has come. Asked why Mladic was not arrested five years ago, Tadic added that there will be an investigation about that, and if the investigation proves that people from the Government or state structures were responsible for interferences with that process, they will be prosecuted as well. Tadic also said that Mladic would be extradited to the United Nations war crimes tribunal but did not specify when, only saying that “an extradition process is under way”. No matter what the feelings and sentiments may be today in Bosnia and Serbia, the arrest is an opportunity both to move on towards a brighter future and a means to better grasp the tragedy of recent history. At the end of the day victims of war and terror in former Yugoslavia may now rest in greater peace and dignity than only yesterday. What a difference a day makes. For Global Voices: Even before the smoke from Monday's Minsk Metro blast dispersed, the dual question of: "What is to be done? - Who is to blame?" arose in the Belarusian blogosphere. Two major strands of thought dominate, blaming either President Lukashenko or the political opposition, although a deeper sentiment of sympathy for the victims seems to unite the people of Minsk. The Monday explosion in a subway station in Belarus capital Minsk is undoubtedly the largest act of violence in Belarus since World War II, leaving tens dead and some hundred injured. Understandably, people in the usually tranquil country reacted with both loathing and anguish, perhaps as a premonition of a shattered social fabric. Still, initial reactions from the blogosphere largely grasped at the question of who was to blame. Такого кошмара люди в относительно спокойной когда-то Белоруссии от режима Лукашенко ещё не ожидали. Последние несколько лет существования диктатуры преподносили много неприятных "сюрпризов" для миролюбивых белорусов, но никто не думал, что это может зайти так далеко. "Such a nightmare, the people of the previously relatively peaceful Belarus had not expected from Lukashenko's regime. The last few years of the dictatorship's existence have heralded many unpleasant "surprises" for peace-loving Belarusans, but nobody thought that it would go this far." Не успел рассеяться дым от взрыва, как в интернете словно по команде появились сотни постов с обвинениями в адрес властей... авторам уже все ясно - виноват опять президент. Злобная Петра на минскбае, засучив рукава, банит всех, кто пытается высказать мнение, отличающееся от утвержденного из Вашингтона. Просто п[---]ц, у этих свиней нет никакой совести... Люди! Одумайтесь!!! Нельзя так бесстыдно использовать чужие страдания!!! "The smoke from the explosion had not even settled, before hundreds of posts, as if by command, appeared on the Internet with accusations directed towards the government... For the authors, everything was already clear - the president is once again to blame. Like a vicious Peter on Minskby [Minsk web community], with sleeves rolled up, banning everyone, who tries to express an opinion, which diverts from the one stipulated by Washington. It is simply **** that these swines have no conscience... People! Come to your senses!!! One should not so shamelessly exploit others' misery!!! P.S. By all apperances, this is an attempt to unfold an Egyptian scenario... Now they will urge [us] to take to the square and so on..."
Вчера произошло два ужасных события. Теракт и реакция на него. Страшно подумать – буквально не успели кровь смыть, как в блогах и твиттере прогрессивная общественность уже стала делать выводы и бросать обвинения. Оппозиция винила власть и белорусские спецслужбы, лоялисты винили оппозицию и зарубежные спецслужбы. Смешалось в кучу всё – доллары, сахар, Ливия – всё, что могло послужить хоть каким-то обоснованием пропаганды. [...] Лично мне кажется, что все эти домыслы и взаимные обвинения похожи на то, как если бы блогеры сбегали на Октябрьскую, перемазались в крови жертв, и стали бы кричать всякие лозунги, типа «это кровь жертв режима!» или «эту кровь пролили отморозки из пятой колонны» [...]. Люди, вам не стыдно? Да, мы по разные стороны политических баррикад. Но разве это повод уподобляться всякой нелюди и устраивать пиар своих идей на крови жертв теракта? Мы что, не в состоянии отбросить идеологические противоречия в эти страшные дни и просто побыть людьми? "Yesterday, two terrible events occured. The terror act and the reaction to it. It is awful to think, but the blood had literally not been washed away before the progressive public already began to draw conclusions and make accusations. The opposition blamed the government and Belarusian special services, the loyalists blamed the opposition and foreign special services. Everything was mixed up in a nice heap - dollars, sugar, Libya - everything that could serve as any basis for propaganda. [...] Personally, I think that all these speculations and mutual accusations are as if bloggers ran down to Oktyabrskaya, smeared with the blood of the victims, and began to call out such type of slogans as "this is the blood of the regime's victims!" or "this blood was shed by the thugs of the fifth column" [...] People, are you not ashamed of yourselves? Yes, we may stand on opposite sides of the political barricades. But is this really a reason to characterize everyone as inhumane and make PR for your ideas by the blood of an act of terror? Are we not able to set aside ideological contradictions during these terrible days and simply be people?" By the end of the day, perhaps some of the last sentiments may prove closest to the truth. It seems that people are simply fed up with the classical duality of "What is to be done? - Who is to blame?" when things go wrong. What this means for Belarus, only the future can tell, but at least it may be a sign of fatigue from the polarized divide between repression and resistance in the country.